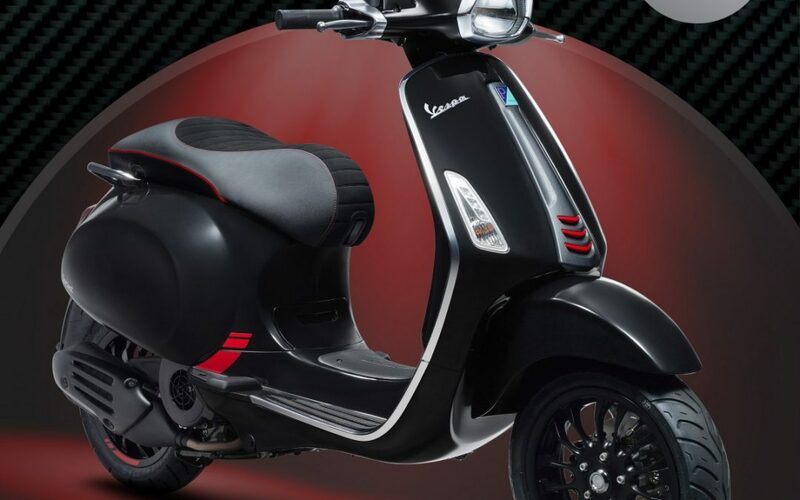 NEW Limited Release Vespa Sprint Carbon - Scooter Central | Your One-Stop Scooter Shop! The modern form of sports performance and design elegance has arrived – the new Sprint Carbon. Equipped with the latest technological features and sculpted with agile, small lightweight body to achieve superior stability and handling, the Vespa Sprint pays tribute to its legendary heritage of the ultimate sports form. Powered by the new iGet single cylinder engine with forced air cooling and electronic fuel injection, the Vespa Sprint Carbon has been reimagined with a stylised black dashboard and tactile carbon textures across carefully considered details such as its sculpted mono-seat and front fender with LED positioning lights while ensuring efficient fuel consumption and maximum agility. Along with its standard safety features; front wheel single channel ABS system, anti-theft system and electronic side stand, Sprint provides convenient saddle storage for a full face helmet with a remote opening system USB port for charging of electronic devices housed with a stylised body as characterised by its signature rectangular headlight. Find out more about this limited release model here or contact our sales team at sales@scootercentral.com.au and 9938 5858 to see how you can get your hands on one today.